For users of BioExplorer or Thought Technology Infiniti, this system focuses on the special needs of trainers. 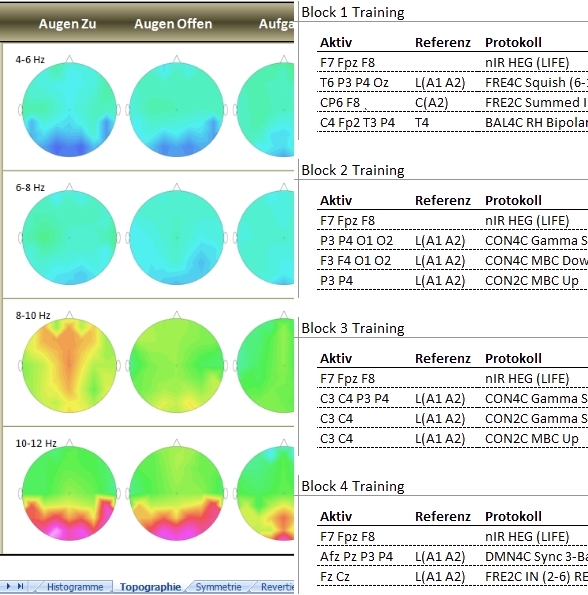 Whole Brain Training begins with a 20-site brain map, the Trainer’s Q (TQ7), using your own hardware and software. With an Electro-Cap, the recording of data with eyes-closed, eyes-open and task can be completed less than half an hour after the client sits in the chair. A detailed Client Report of history and symptoms can be completed online and automatically loads into the assessment. Processing is even faster and involves no additional cost. The TQ7 automatically loads the recorded data and a Client Report of history and symptoms completed online. It automatically removes artifact. It produces a 6-8 page report summarizing patterns found in the client’s brain and symptoms that might be expected.The assessment and training plan can be produced in English, Spanish, Portuguese, Italian or German.All this processing takes 5-10 minutes. Pages can be output as PDF files or printed to share with referral sources, family and client. The assessment also automatically produces a customized Whole-Brain Training Plan (WBTP), which defines a circuit of 5 training sessions customized for the client’s brain. The trainer cycles through these sessions, working a different set of patterns in each–just as you would when training at the gym. The plan also produces a tracking page that allows the trainer and client to select and follow specific target change indicators. Pre and post Client Reports compare symptom patterns and show changes over the course of training. Most trainers begin reducing the frequency of training as they reach the 3rd or 4th circuit and track how well the changes are lasting. This workshop demonstrates processing of the TQ7 data, looks at artifacting practices, explains the Executive Summary report, shows how the Client Report system can be used, reviews a WBTP and demonstrates some of the brain-trainer designs currently available in BioExplorer and being developed for Infiniti. Learn about brain-trainer’s application of sophisticated assessment and training techniques to the work of clinicians. Practical, cost-effective, integrated and client-centered. Video download is in 2 parts plus sample assessments and slide show in a zip file. Links for download are in Order Complete email.